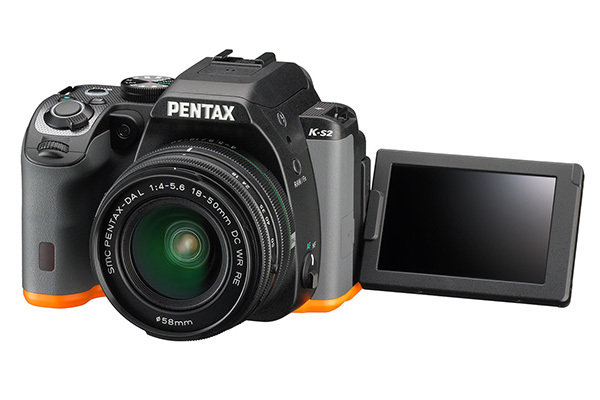 The Pentax K-S2 is the world’s smallest weather-resistant D-SLR, giving you peace of mind in any shooting conditions. It’s only fractionally bigger than the tiny Canon EOS 100D, yet the K-S2 is sealed in 100 locations on the body, keeping the elements out. The 18-50mm f/4-5.6 lens is equally protected. It offers a film-equivalent focal length of 27-75mm and is currently the world’s slimmest standard D-SLR zoom lens, protruding just 41mm when fully retracted. The CMOS sensor has a resolution of 5472x3648px and there’s no Anti-Alias filter to soften image quality. However it does feature an AA filter simulator, which works by vibrating the sensor to reduce the effects of moiré when shooting at shutter speeds slower than 1/1000sec. The micro motors that vibrate the sensor are also used to drive the built-in Shake Reduction system. This works with all lenses to combat the effects of camera shake at slower shutter speeds, giving a 3.5-stop advantage. It also offers sensor Dust Removal via high-speed vibrations. 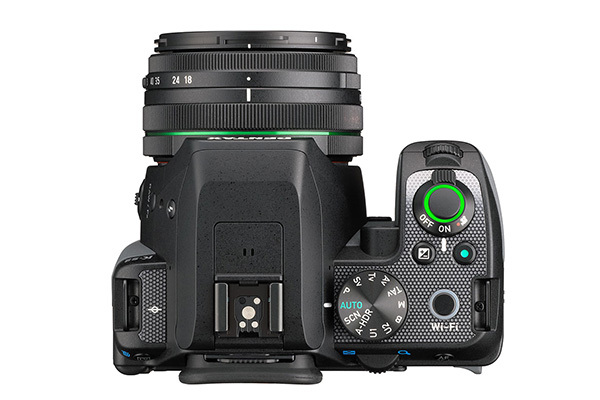 The PRIME M II image processor provides the K-S2 with a maximum burst rate of 5.4fps and ISO range of 100-51,200, matching the specs of its sibling. The focusing setup differs in this release, though. The SAFOX X AF system expands the low-luminance limit to -3EV; so it will still work when light is scarce. There are 11 AF points, and nine of them are more advanced cross-type sensors that give fasterfocusing. You can choose whether you want to set to Auto-select AF, Single AF or Continuous AF, and Expanded Area AF means the camera will automatically track moving subjects. To compose shots you can use the optical viewfinder with 100% frame coverage or the 3in Vari-angle monitor. The 921k-dot LCD contains a special resin which removes light reflection from the surface, making it easier to view in bright light. This is also the first Pentax model to feature an articulated screen for awkward angles or self-portraits – here, the Wi-Fi button becomes the shutter button, giving a steadier hold. The K-S2 is both Wi-Fi and NFC enabled, so it can be paired with the Image Sync app. This allows you to control the camera remotely, view pics and upload to the web via a smartphone. The K-S2 has a futuristic vibe, and takes on a deep rubberised grip and rear thumb-pad. The front grip feels a little squared off so it’s not the most comfortable to hold, but it does provide a solid purchase. The button layout is ergonomic, placing the controls directly at your fingertips. There’s both front and rear command dials which control shutter speed and aperture, making it quick and simple to adjust exposure settings on the fly. The 18-50mm kit lens retracts to save space in your kit bag. But, the button you need to press to do this is rather small, and on occasion was a little stiff to operate if not pressed correctly. The button to release the lens is quite fiddly too, as it sits on the grip side of the D-SLR. On the top is a mode dial with M,A,S,P modes, as well as Auto, Bulb, two User modes, Scene modes, and Advanced HDR mode. Also found here is Sensitivity priority (Sv) – giving control of the ISO only – and Shutter & Aperture priority (TAv) – letting you adjust both the main exposure settings, while the camera sets the ISO. To return to Program mode, just press the green button on the top-plate. The menus are easy to navigate, and the Info button gives quick access to frequently used settings, reducing the need for buttons to clutter the layout. Focusing through the optical viewfinder is impressively smooth and rapid, even when the light dips. We found it locked on to a range of challenging subjects, and the Expanded Area AF kept track of moving subjects. Our only issue was that it was a little confusing to set the active AF point as the central D-Pad button needs to be held down to this. Focusing with Live View is noticeably slower than when using the viewfinder, though. The focus would often hunt back-and-forth as it attempted to get a sharp lock. This is the case with most D-SLRs, as the less effective Contrast-detect AF is used when the mirror is up. But, composing with the Live View was a joy as the articulated screen makes it easy to frame up from high or low angles. We found the PRIME M II image processor gave a fantastic performance. When set to shoot JPEGs at a top burst speed of 5.4fps, we fired off hundreds of frames without the camera showing any sign of slowing. Single JPEGs were saved to our 95MB/s PNY SDHC test card instantaneously. In RAW, we rattled off a burst of 11 shots before the pace faltered, and these were written in 5.2secs. A single RAW took just 0.7secs to save. 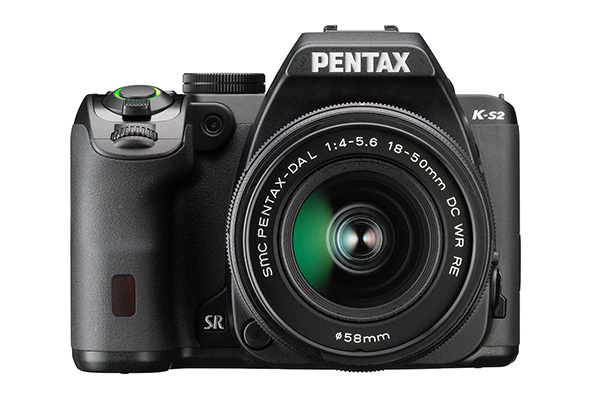 The K-S2 comes bundled with the 18-50mm f/4-5.6 lens and costs £649, or has an RRP of £549 body-only. This represents excellent value considering its features and performance. If you’re considering the K-S1, this could be the better option! Its main rival from Nikon is the D5500 (£669 with 18-55mm lens). It sports a 24.2Mp sensor, shoots at 5fps, has Wi-Fi and has a touchscreen that flips out for awkward compositions. Canon’s EOS 750D boasts an 18-55mm lens, 24.7Mp sensor, shoots at 5fps, offers 19 cross-type AF points and has a vari-angle touchscreen, at £689. The K-S2 has everything you’d want from an enthusiast D-SLR. If you’re new to the market and haven’t already invested in lenses from another manufacturer, then this camera is certainly worth considering. Despite sharing a sensor and a few specs with its sibling, the design offers quite a departure from the K-S1, and is all the better for it. Although the model we tested was white, the camera is available in 10 different colours. Whether you view that as important or merely a gimmick, the camera underneath can hold its own against its fiercest rivals. It’s got great shooting controls, a sturdy AF system, and modern features like Wi-Fi and a speedy processor. What’s more, it houses them all in a neat, compact body that’s sealed from the elements, so you don’t have to worry when shooting in adverse weather. For these reasons, the K-S2 is a very impressive camera.